McCann Associates has partnered with public and private organizations for over five decades to assist them with a full range of human resource, employee development and productivity, and business management needs. Whether you are a small business or a multinational corporation, the full suite of products that McCann offers can take a prospective employee from the first stages of screening for a position, through the cycle of promotions and evaluations, all the way to retirement. McCann Associates provides scalable products and services that will help you address your unique business challenges and ensure return on investment for your corporate learning and human resources programs. Measured Success™ is a fully customizable assessment platform that enables efficient and reliable workforce evaluation at all levels and stages of an employee’s career. The capabilities of Measured Success™ are extensive, yet they allow for targeting specific needs. Human Resource departments can easily manage the employee life cycle from recruitment to retirement, including candidate assessment, tracking and managing the employee acquisition process, and identifying employee skill gaps and competencies. Detailed reporting features ensure managers have a clear picture of their employees at all times, enabling them to build strong teams. Writing is a skill required universally across industries. From technical reports and sales proposals to e-mails, presentations, and memos, writing plays a crucial role in everyday communication and documentation. 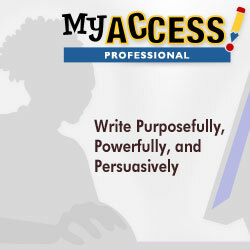 MY Access!® Professional Edition is designed specifically to guide professionals through the process of learning to write purposefully, powerfully, and persuasively. MY Access!® Professional Edition lessons and writing activities offer “MBA-specific” prompts designed to develop and refine professional written communication to improve internal communication and external reputation. For daily use, CorrectEnglish™ is an infinitely deployable writing development solution designed to support the writing process from simple grammatical checks to composition and publishing. From e-mails, letters, and memos to proposals, cover letters, and reports, CorrectEnglish™ makes the writer accountable for their own development with industry-leading tools of support. No costly installation or IT support is required; users only need an Internet connection and a Web browser. This means CorrectEnglish™ follows the user around the office, in the field, or at home. The ability to interact with vast amounts of data to get actionable answers is critical in making informed decisions quickly and effectively. Rather than a pre-defined set of static reports, iSEEK Supercruncher™ offers infinite scalability that makes every conceivable combination of inquiry related to performance management available in seconds. This unique approach to flexible data selection and drill-down capability guarantees the data to be actionable for the decision-making process. With this simple question-and-answer interface, institutions can save money on data warehousing and eliminate risks of wasted resources associated with knowledge deficit. Additionally, you want your customers to easily and quickly find resources. iSEEK™ Targeted Discovery is a comprehensive data indexing and discovery solution that can inform and empower stakeholders. Combining a powerful cataloging engine, an intuitive presentation of search results in context, and a low cost of implementation, iSEEK™ breaks down the barriers between you, your prospects, and your customers. Building upon years of research in natural language computer interfaces, iSEEK™ does not just rely on matching keywords to find information. Results are presented from all data sources, pinpointed to the exact place within the document where the answers are for “targeted discovery.” There are no software installations; as more data is added, iSEEK™ scales right along with you, controlling costs while further empowering your customers.